Demantoid is derived from the Dutch word for diamond, "demant." The stone owes its impressive diamond like brilliance to two main factors: A high refractive index and a high dispersion (its ability to separate light into the spectrum of colors). Demantoid, in fact, boasts the highest dispersion rating of all gemstones, including diamond. Like any gemstone; the gem's color and clarity can vary as seen in the two pictures here. Unlike diamonds, clarity is considered secondary to color in color gemstones. Fine quality demantoid garnets are rarely found in sizes larger than 2 carats, a fact that makes the examples on this page all the more impressive. The cushion cut demantoid, shown above, is a world class gemstone and one of the largest and finest faceted demantoids known. This 11.24 carat gem was mined in Russia in the late 1990s and exhibits the highly prized vivid intense emerald green color. The gem joined the Smithsonian Gem and Mineral Collection in 2011. The 6.96 carat oval demantoid, shown below, is from the Green Dragon Mine in Namibia and exhibits a medium dark yellowish green color. It was purchased on behalf of the Smithsonian in 2014 with funds from the Tiffany & Co. Foundation. 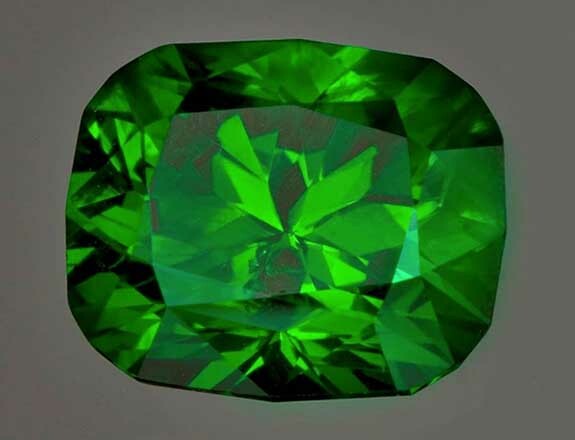 Interestingly, George F. Kunz, who was Tiffany and Co.'s vice president of gemology from 1879 until his death in 1932, was a big fan of demantoid garnets and reportedly purchased all the rough material he could get his hands on. As a side note, the gemstone kunzite was named for George Kunz. 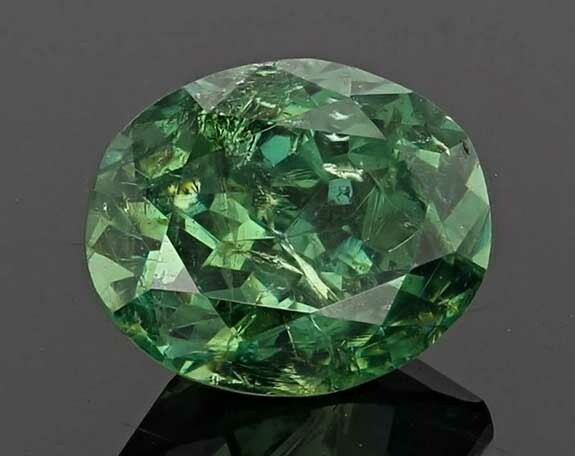 African-origin demantoid tends to be yellowish green, olive green or brownish, due to higher concentrations of iron. Russian material, on the other hand, owes its color to chromium and tends to be vivid green.